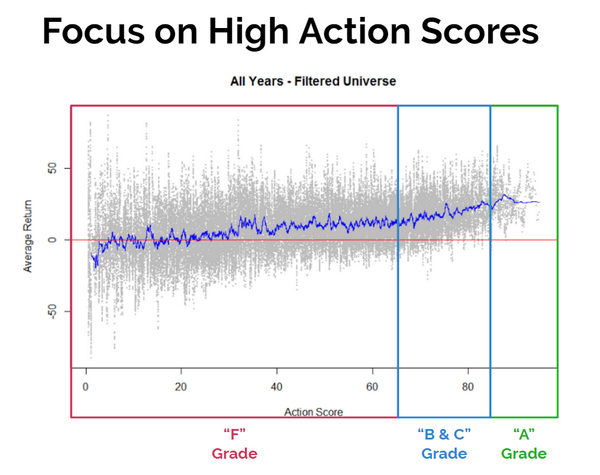 To quickly review the previous email tutorial, the Action Score is an equal average of Q,V,G. 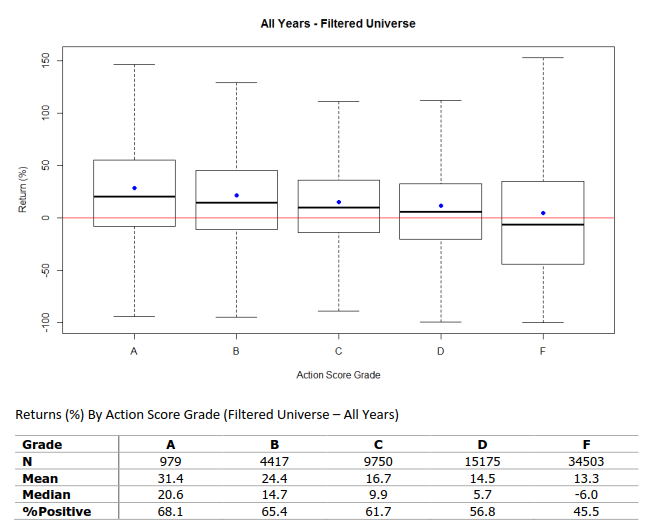 Each score consists of 3-4 value focused metrics to come up with a score between 0-100. Focus on the stocks graded A to C as they lead to higher returns. One of the differences between how old school value works compared to other services is that we aim to improve and simplify your investment process, instead of drowning you with data. The problem is that if you use the typical method of looking for and researching stocks, you will waste 1-2 hours going through news and getting distracted. The 80/20 rule applies to the stock market too. 80% of stocks are not worth your time. If you recall the chart I showed you in the previous email, low scoring stocks do worse. There's a big difference between the median returns. A grade stocks returned 20.6% from 1999-2015. F grade stocks returned -6% from 1999-2015. Why waste your time looking at them? Isn't it better to quickly identify the garbage, ignore it and move onto something that is worth your time? That's where the role of a "routine" comes into play. Much like your morning routine which you do every day with your eyes closed, you should apply the same concept with your search and analysis. Instead of immediately diving into the details or getting distracted by all the info, zoom out, apply the Action Score filter. Focus on the best, forget the rest. Here's the best way to use OSV Online. The Home page is designed to provide you with stock ideas that fall into Quality, Value and Growth. Use the home page as a hub to quickly scan for daily ideas. 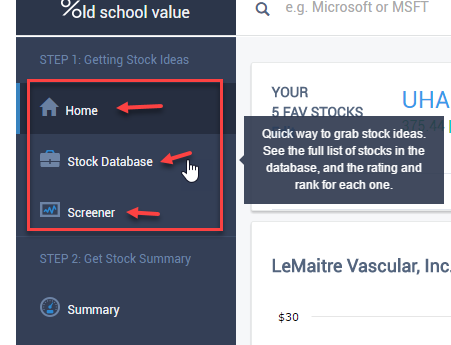 You can also get more ideas from the "Stock Database" and Screener. Use the Stock Database to view every stock we offer in our database. You can also create a customized and personalized screener to get more ideas suited to your style of investing. Instead of wasting time reading news headlines, then getting distracted, reading comments on articles or browsing Facebook or twitter, this is your idea box. Whether you use a stock from the Home or your own stock, the second step is to determine whether it's worth your time. You do this by going through the Summary and OSV Ratings section of the app. Although a stock may look undervalued, is it rated a D or an F? A stock may have an A grade, but is it way overvalued? 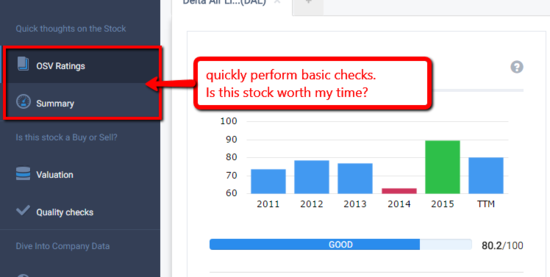 Sometimes a stock is cheap but what's the reason? By checking the OSV Action Score ratings, you can check to see where a particular stock fails, or where it shines. By comparing the fair value chart with the OSV Ratings, you can discover and stay away from potential value traps and find hidden gems. If there's a stock that you like and it passes step 2, the next step before you deep dive is to validate the idea. Don't set yourself up for failure by falling in love with a stock before you validate it. Use your intuition to do a quick valuation. You can use the default or enter the numbers that you think make sense for the company and industry. The goal is to figure out whether you want to take the next step to do a deep dive. Most of the time, you'll spend 80% of the time going back and forth between steps 1 to 3. Follow the flow chart above. When you come across a stock you like, then it's time for that deep dive. Final step is to then dig into the numbers and this is again where OSV shines. Our history is based on digging into the fundamentals. You'll be able to buy and sell with confidence and this process will save you a lot of time and headache. Before old school value, most people start at step 4, get overwhelmed and then give up. We only have 24 hours in a day and it's mostly filled up with work or other tasks. The goal is to streamline your investment process so that it isn't more difficult than it has to be. Utilize this basic routine and you'll see just how efficient you become from the initial stages of finding ideas to the final investment decision. 80% or more stocks are junk. Focus on the 20% investable stock universe - we grade all the stocks to make it easy. As we move into the thick of things, I'm going to provide details of how to quickly read and interpret the Action Score bars. You'll see how powerful it is and how it's like having a personal stock analyst do the work for you.